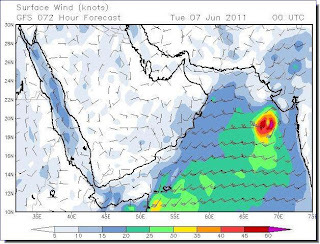 MUSCAT— Reports of a low pressure formation over the Arabian Sea have triggered fresh rumours of a cyclone hitting the sultanate this week. The Seeb Met Office, however, on Monday said it was not expecting any major change in the weather conditions in the country over the next three days. “The latest surface pressure charts, satellite images and latest reports received from the Regional Centre for Monitoring Tropical Systems indicate the presence of a tropical low pressure system in the North East of the Arabian Sea near the western coasts of India centred at 19 N degrees latitude and 71.5 E degree longitude about 120 kilometres off the coasts of India,” DGMAN said in a statement. It added that the newest numerical weather prediction charts showed that the low pressure would continue moving parallel to the Indian coasts in the next two days with a chance for further intensification. The statement said no direct influence was expected from the low pressure system on Oman’s weather for the next three days, adding that DGMAN would continue to monitor the situation and keep the public informed about new developments. A number of weather forecasters based abroad, meanwhile, reported that the low pressure had developed into a tropical storm, named “Keila’” by the Maldives, and was moving towards India’s Maharashtra-Gujarat coastal areas. 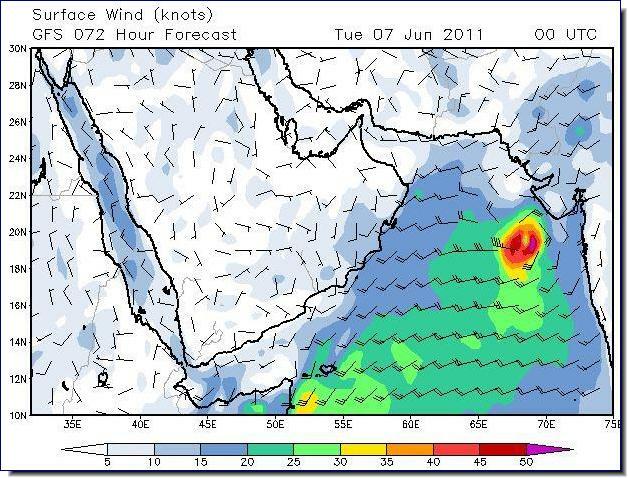 From India, they said, it would likely head for Oman and hit the sultanate on Friday. Strong rumours of an impending cyclonic storm striking Oman have been taking the rounds here in the past several weeks and had been dismissed as baseless by the country”s weather authorities. Oman was hit by a powerful cyclone, “Gonu’” in June 2007 bringing unprecedented devastation in its wake. Another cyclone, “Phet”, with far less intensity, struck last year, also in the month of June.